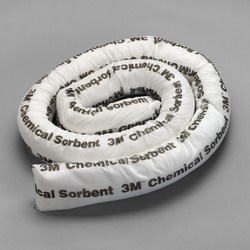 Chemical sorbent mini-booms are typically used to encircle spills and to contain leaks. A 3 inches diameter scrim on the outside of the boom identifies the application. The 3M™ Chemical Sorbent Mini-Boom P-208 is 8 feet in length.